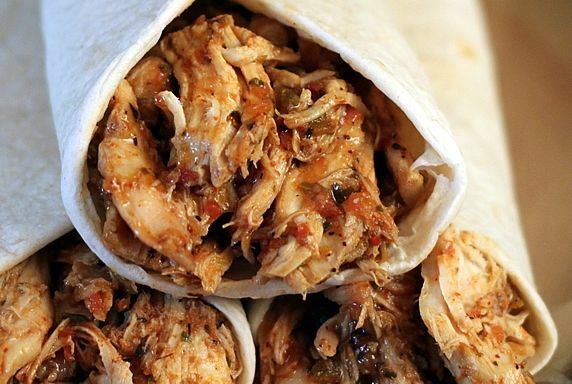 This easy flavorful chicken makes a delicious filling for tacos, burritos, chimichangas and enchiladas. It's also great on nachos and taco salads. Use as filling for tacos, enchiladas, chimichangas & burritos along with your favorite toppings. Also good on nachos and salads. Freezes and reheats well. SLOW COOKER OPTION: You can cook this start to finish in a slow cooker. 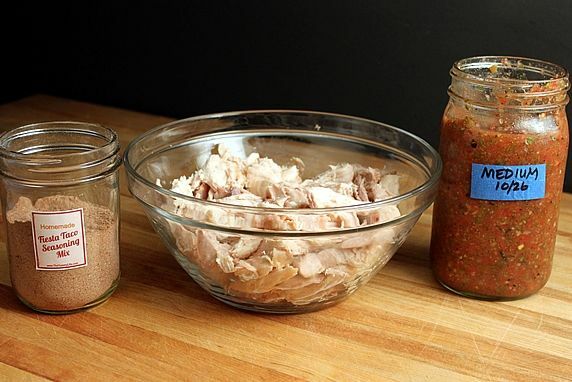 Add raw, skinless, boneless chicken along with other ingredients (omitting the water) to your slow cooker, cook on low for 4-6 hours until fork tender, shred the chicken with 2 forks, mix with sauce, and it's ready to eat. I've got a few more recipes to share from our Mexican Buffet Party menu. This chicken was one of the three meat choices for the Taco Bowl Bar at our party. It's an easy recipe that makes a delicious filling for tacos, burritos, chimichangas and enchiladas. It's also great on nachos and taco salads. 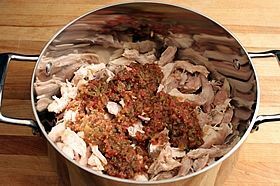 I make this flavorful chicken using my homemade salsa and taco seasoning, but I often use shredded rotisserie chicken for a short cut. It's also a good use for leftover chicken or turkey. You can use prepared salsa and taco seasoning from the store, if you really want to speed things up. Once you have the ingredients assembled, this chicken is finished in 10 minutes. It's fast, easy, healthy, versatile...and yummy! Step 2. 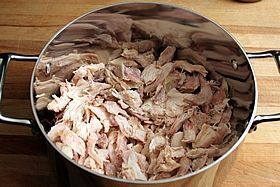 Add shredded chicken to 3 quart (or larger) pot. Step 3. Add the salsa. Step 4. 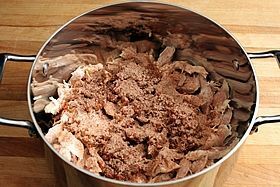 Add taco seasoning mix and stir with chicken and salsa until evenly distributed. Step 5. Add water and stir. Step 6. Cook over medium heat until hot throughout, approx. 10 minutes. The cornstarch in the taco seasoning mix thickens the sauce so it clings to and evenly coats the chicken. Done! How easy is that? The result is tender, flavorful chicken. It's good hot or cold. For a simple meal, serve this chicken in flour or corn tortillas along with any of your favorite Mexican condiments (guacamole, salsa, sour cream, etc). 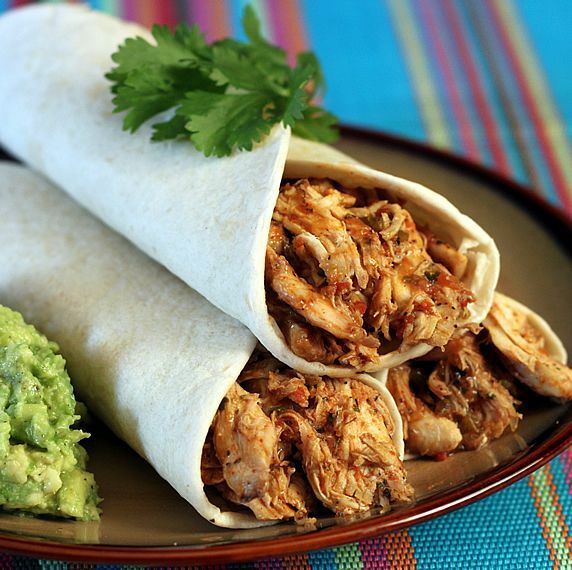 This chicken freezes well, and is great to have on hand for preparing a variety of Mexican dishes. 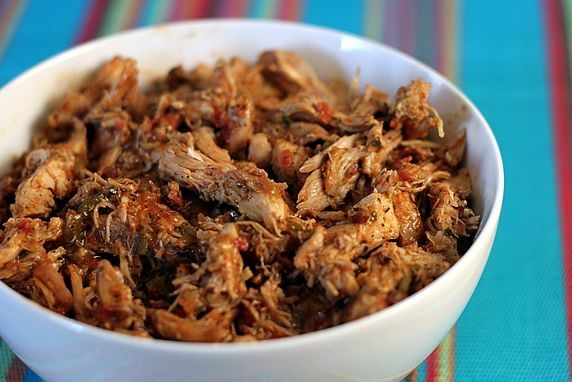 SLOW COOKER OPTION: You can cook this start to finish in a slow cooker. 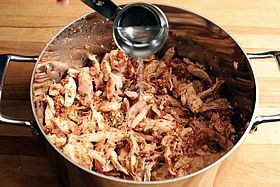 Add raw, skinless, boneless chicken along with other ingredients (omitting the water) to your slow cooker, cook on low for 4-6 hours until fork tender, shred the chicken with 2 forks, mix with sauce, and it's ready to eat. Be careful not to overcook the chicken, or it will turn into mush. 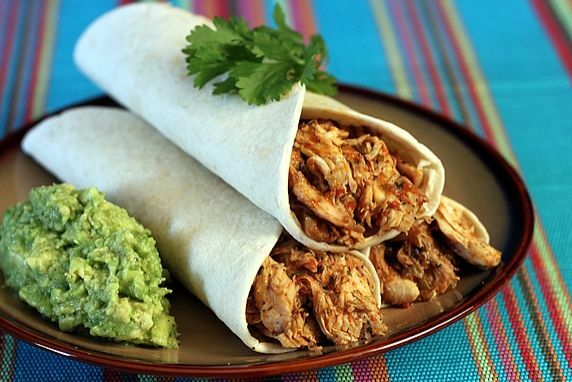 The flavors of the salsa and taco seasoning are the perfect blend for this delicious chicken. 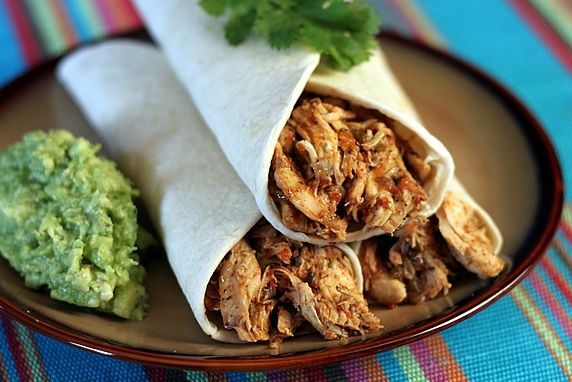 This Fiesta Salsa Chicken is great in a Tortilla Bowl Taco Bar. Here's how.